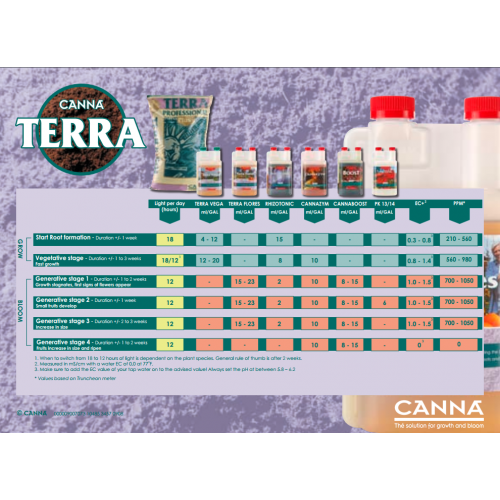 As a complete soil nutrient for plant growth during the flowering stage, Canna Terra Flores contains just the right amount of essential nutrients such as phosphorus and potassium needed to sustain the plants during the flowering cycle. 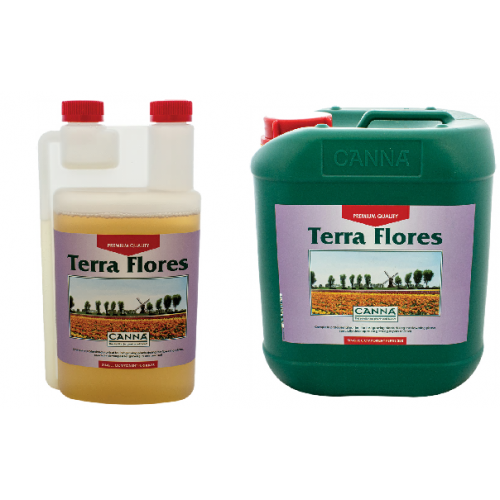 Terra Flores helps stimulate both fruit formation and flavor. This extraordinary product can be used in both open soil and potting as well as in both indoor and outdoor environments. Both professional and private gardeners alike have raved about the benefits of this amazing feeding system. Canna Terra Flores is so easy that even a beginner can use it with no problems. It dissolves quickly and easily and is designed for use with “run-to-waste” system. It helps prevent the soil from binding nutritional ions and is beneficial in fruit formation as it contains all of the necessary nutrients that your plants need during the flowering phase of development. With the perfect amounts of both phosphorus and potassium, your crop will have all the nutrients needed for a healthy growth and development during the flowering cycle. Do not use in reed beds, swampy or wooded areas, and surface water, in or near groundwater collecting areas, hedges or protected nature reserves.